Download the theme from your account. Sign into your WordPress dashboard (e.g., yourdomain.com/wp-admin). Navigate to Appearance > Themes > Add New > Upload, and select your zipped theme folder. Once the theme is uploaded you will need to activate it, either with the provided link or under Appearance > Themes. Note: If you use Safari as your primary browser you may find that your theme folder is not zipped after downloading it. You will need to re-compress your theme folder before initiating the second installation process. 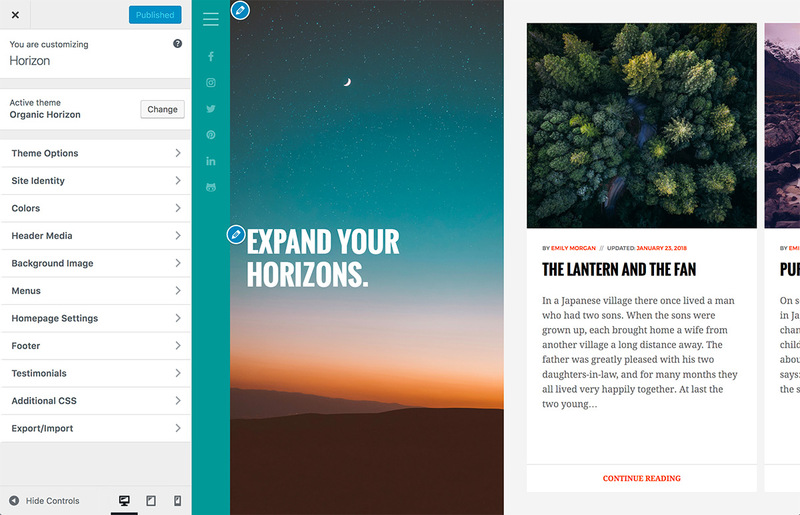 The Organic Customizer Widgets plugin may be used to create various content sections on any page with the “Organic Custom” page template applied. Instructions for using the plugin can be found here. Note: The contact form is powered by Gravity Forms, an excellent premium WordPress contact form plugin (free alternatives include ‘Contact Form 7’ and ‘Jetpack Forms’). If you want to make use of the shop portion of the theme you will need to install WooCommerce. The theme utilizes shortcodes from the Organic Shortcodes plugin. Please refer to the following links for examples. You can setup and manage your menu under Appearance > Menus, in your WordPress dashboard. The theme utilizes 2 custom menus; a Main Menu, and Social Menu for displaying social media icons. See the Codex for an explanation of the custom menu system (Note: this tutorial is for WordPress.com, but the process is the same). All options for the theme are located within the WordPress Customizer. Navigate to Appearance > Customize to setup the options for your theme. The Customizer options for the Horizon Theme. The theme provides options for selecting specific post categories for display on your Blog, Testimonials and Portfolio page templates. To change the page template options, navigate to Appearance > Customize > Theme Options > Page Template Options within the WordPress admin. The theme provides options for selecting from hand-picked font pairings. To change the fonts, navigate to Appearance > Customize > Theme Options > Fonts within the WordPress admin. Logo Resizer: Within the Appearance > Customize > Site Identity options, the theme features the option to upload and scale a logo image to the size of your liking. Title Font: Within the Appearance > Customize > Site Identity options, the theme features the option to change the Site Title font from a list of hand-picked Google Fonts. Site Identity: Additionally, within the Appearance > Customize > Site Identity options, you may choose to toggle the display of your Site Title, Site Tagline and Search Field. Colors: Within the Appearance > Customize > Colors options, you can optionally choose different colors for the menu background, header background, and various link colors. Footer: Within the Appearance > Customize > Footer options, you can optionally change the footer credit for your website. Please see our ‘Quick Start Guide’ for setting up the theme’s various page templates. 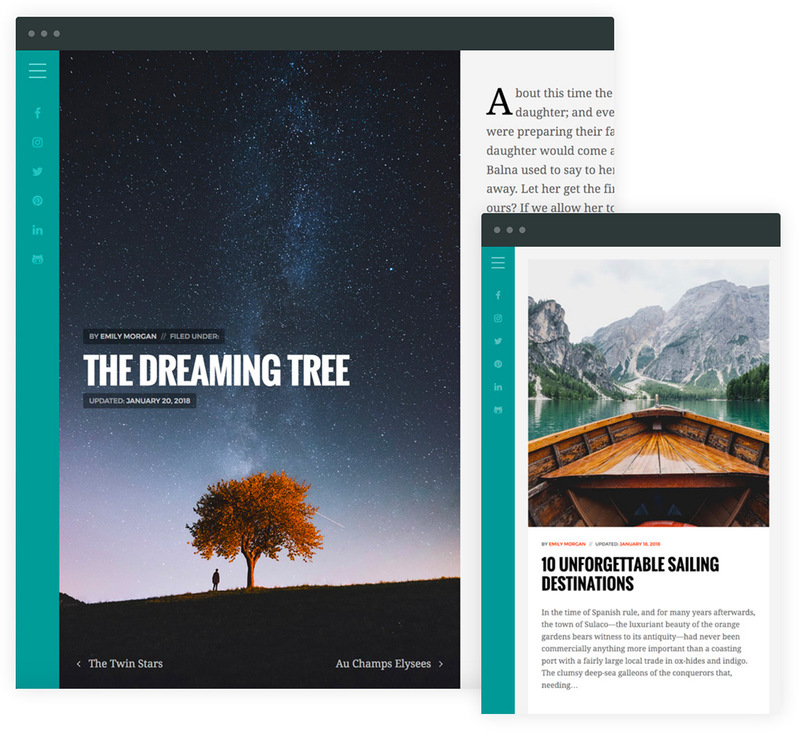 The theme contains a Portfolio page template that uses Jetpack custom post types to display projects. Alternatively, if you do not have Jetpack installed, you may select a post category for the portfolio under Appearance > Customize > Theme Options > Page Template Options. You may choose the column layouts for the Portfolio page template under Appearance > Customize > Theme Options > Layout. The theme contains a Testimonials page template that uses Jetpack custom post types to display testimonials. Alternatively, if you do not have Jetpack installed, you may select a post category for the testimonials under Appearance > Customize > Theme Options > Page Template Options.